Find and compare the best prices from a range of well known car rental companies at Rovaniemi Airport. This is a free to use facility, enabeling you to book direct with the company quoting the price. 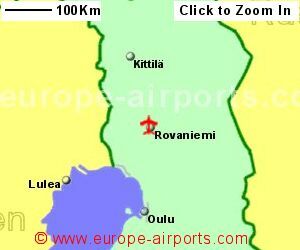 Rovaniemi literally sits on the Artic circle, in northern Finland. The bus service into Rovaniemi costs 7 Euros or a taxi costs around 20 Euros per person. Shuttle buses are also available to hotels. At appropriate times of the year, reindeer or dog team sleigh rides are available to Santa Claus Village. The airport has 2 cafes/restaurants, 2 shops, duty free, childcare room, and FREE WiFi Internet access. Rovaniemi airport has Airport Carbon Accreditation, at the Reduction level. Rovaniemi airport is within walking distance of Santa Claus house and catered for 579,000 passengers in 2017 (a large proportion of which would be around Xmas), an increase of 18% compared to the previous year.